As a Hammond organ player, Carlo de Wijs (the Netherlands, 1962) was formed by a mix of many inspirations and influences: iconic Hammond players such as Rhoda Scott, Jimmy Smith and Eddy Louiss; heroes such as Quincy Jones, Stevie Wonder and Joe Zawinul. Together with the current interesting developments in electronic music they are a guarantee that he will always try to reinvent himself artistically. Carlo graduated with honours as Performing Musician at the Rotterdam Conservatoire (now Codarts Rotterdam) in 1988. Carlo has played in his own ensembles, including D’WYS & Voices of Soul, and as soloist with Candy Dulfer’s Funky Stuff, Benjamin Herman, Lucas van Merwijk and the Metropole Orchestra, and others. He has shared the stage with Steve Lukather of TOTO, Gary Brooker (Procol Harum), and Rhonda Scott. He has released eight albums of his own and was a session musician in countless productions. He also presented a special Hammond Alive programme on Radio 6 and initiated the website HammondSongbook.com. He is currently writing his PhD thesis on the history and innovation of the Hammond organ and working on the New Hammond Sound Project together with Codarts alumnus drummer Jordi Geuens. What will you be teaching Codarts students? Music is a way to grow your personal identity and Codarts provides a breeding ground. It’s all about Bildung: ‘building’ yourself as a human being and a personality. Development and innovation are crucial in this. By connecting this idea to the craft of making music and creating things, you have a personal basis to go on developing your whole life through. By teaching students the history of music and the instrument and help them master this complex instrument in terms of playing, writing, producing and working together. 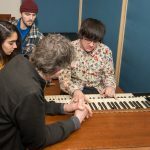 In addition to existing styles, the Hammond organ can play a part in developing new styles, because it has such an innovative origin that there are still many new roads to explore. It would be great if the next generation of Hammond students would take the lead in innovating the field.